Lumbar puncture is a common emergency department procedure used to obtain information about the cerebrospinal fluid (CSF) for diagnostic and, less commonly, therapeutic reasons. Please refer to the full article on Lumbar Puncture for more details on the lumbar puncture procedure. However, the use of bedside ultrasonography for the identification of the pertinent landmarks for lumbar puncture is a safe and easy alternative to the blind technique. Additionally, ultrasound may be used in advance of attempted lumbar puncture in order to predict ease of performance or anticipated difficult lumbar puncture. Ultrasound-guided lumbar puncture was originally reported over 30 years ago in Russian literature, and it is routinely used by many anesthesiologists for epidural and spinal anesthesia. Additionally, studies in neonates and children have used bedside ultrasonography to attempt to determine optimal positioning for lumbar puncture. Using ultrasound to measure the interspinous space at L3-L4 and L4-L5 in varying positions, the lumbar spine was found to be maximally positioned in both neonates and children in the seated position with flexed hips versus the lateral recumbent position with neck flexion. [7, 8] A study in adults would be needed to make a similar recommendation regarding optimal position for lumbar puncture; however, the sitting position may be optimal in adults as well as children. Ultrasonographic guidance may be beneficial in all patients who require lumbar puncture. Ultrasonographic guidance is most helpful in those patients in whom lumbar puncture is challenging because of the inability to adequately palpate necessary landmarks (eg, patients who are obese or have spinal disorders). Ultrasonography is safe and painless, with virtually no inherent risks. No anesthesia is required when using bedside ultrasonography to identify appropriate landmarks. Local anesthesia is, however, required prior to performing the actual lumbar puncture. For more information, see Local Anesthetic Agents, Infiltrative Administration and Lumbar Puncture. The lateral decubitus or sitting position may be used, depending on the patient's status and provider preference. The patient remains in the selected position during ultrasonographic identification of landmarks and the lumbar puncture procedure. 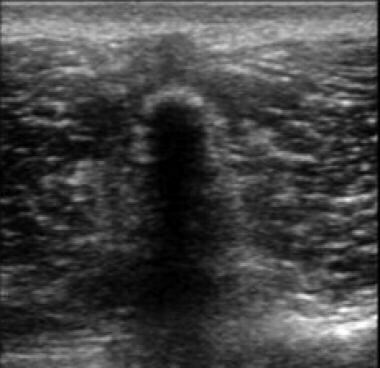 To find the interspinous space, place the ultrasound probe with the probe marker toward the clinician's left side in the transverse plane over the midline of the back at the level of the iliac crests, as shown below. 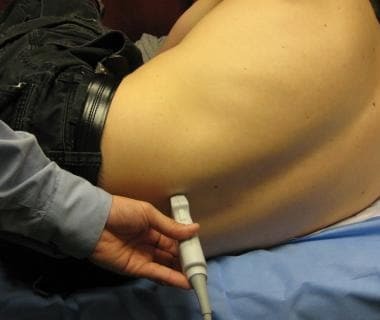 Ultrasound probe in transverse position. In this view, the spinous processes appear as distinct hyperechoic structures with associated acoustic shadows. Identifying the spinous processes identifies the midline of the spine. Centering this shadow on the screen places the probe directly over the midline of the spine, as shown below. Transverse ultrasound image of the lumbar spine demonstrating a midline dorsal spinous process. Note its characteristic crescent-shaped, hyperechoic spine with posterior acoustic shadowing. With the probe in the position described above, mark the midline of the spine at the center of the probe using a surgical marker or pen. Then drag the probe superiorly or inferiorly to the next spinous process and again mark the midline of the spine. Make marks appropriately large and visible so that they can be easily located and extended once the ultrasound probe is removed. 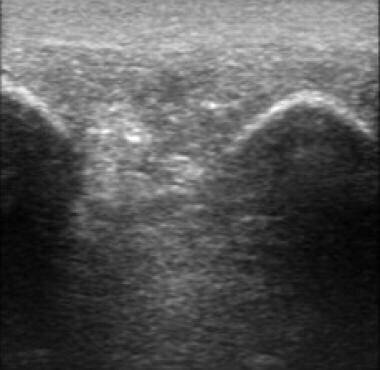 Although these ultrasound images are obtained in the transverse plane, these markings are made and connected in the sagittal plane. Next, rotate the transducer into the sagittal (or longitudinal) plane with the probe marker pointing toward the patient's head. The probe should be parallel to the direction of the spine and placed directly between the spinous processes that were just marked, as depicted in the image below. Ultrasound probe in sagittal position. The spinous processes are seen as crescent-shaped, hyperechoic, upward convexities occurring at the same depth as the shadowing noted on the transverse view, as shown below. The gap between the hyperechoic convexities is the interspinous space. Sagittal view of the interspinous space. The superior dorsal spinous process is seen on the left side of the image while the inferior dorsal spinous process is seen on the right side of the image. The acoustic shadows generated define the superior and inferior borders of the interspinous space. Center the interspinous space on the screen and then mark the level of the middle of the interspinous space on both sides of the probe. Since the probe is in the sagittal plane, these marks are made in the transverse plane, slightly to the left and right of the center of the probe. Again, make the marks appropriately large and visible so that they can be easily located and extended. Remove the ultrasound probe and extend the transverse and sagittal skin markings until they intersect. The point of intersection of these lines represents the middle of the interspace and the most ideal location at which to insert the lumbar puncture needle, as depicted below. Use alcohol to clean the area before attempting to mark the skin. This eliminates ultrasound conducting gel and natural skin oils that may lessen or obscure the ink. Use permanent or semipermanent skin markers so that marks are not removed when the area is later prepared for the sterile lumbar puncture. If the area is to be sterilized before the appropriate landmarks are identified with ultrasonography, then the use of a sterile probe cover and sterile marking pen are required. Use of bedside ultrasonography to identify pertinent landmarks poses virtually no risks or complications. Possible limitations include lack of ultrasound machine availability and the time required by clinicians to develop the comfort and skill necessary to perform ultrasound-guided procedures. Furness G, Reilly MP, Kuchi S. An evaluation of ultrasound imaging for identification of lumbar intervertebral level. Anaesthesia. 2002 Mar. 57(3):277-80. [Medline]. Stiffler KA, Jwayyed S, Wilber ST, et al. The use of ultrasound to identify pertinent landmarks for lumbar puncture. Am J Emerg Med. 2007 Mar. 25(3):331-4. [Medline]. Dietrich AM, Coley BD. Bedside pediatric emergency evaluation through ultrasonography. Pediatr Radiol. 2008 Nov. 38 Suppl 4:S679-84. [Medline]. Chin KJ, Ramlogan R, Arzola C, Singh M, Chan V. The utility of ultrasound imaging in predicting ease of performance of spinal anesthesia in an orthopedic patient population. Reg Anesth Pain Med. 2013 Jan-Feb. 38(1):34-8. [Medline]. Peterson MA, Abele J. Bedside ultrasound for difficult lumbar puncture. J Emerg Med. 2005 Feb. 28(2):197-200. [Medline]. Nomura JT, Leech SJ, Shenbagamurthi S, et al. A randomized controlled trial of ultrasound-assisted lumbar puncture. J Ultrasound Med. 2007 Oct. 26(10):1341-8. [Medline]. Abo A, Chen L, Johnston P, Santucci K. Positioning for lumbar puncture in children evaluated by bedside ultrasound. Pediatrics. 2010 May. 125(5):e1149-53. [Medline]. Oncel S, Günlemez A, Anik Y, Alvur M. Positioning of infants in the neonatal intensive care unit for lumbar puncture as determined by bedside ultrasonography. Arch Dis Child Fetal Neonatal Ed. 2012 Jun 9. [Medline]. Kim S, Adler DK. Ultrasound-assisted lumbar puncture in pediatric emergency medicine. J Emerg Med. 2014 Jul. 47(1):59-64. [Medline]. Wang PI, Wang AC, Naidu JO, Dipietro MA, Sundgren PC, Quint DJ, et al. Sonographically guided lumbar puncture in pediatric patients. J Ultrasound Med. 2013 Dec. 32(12):2191-7. [Medline]. Noble VE, Bret Nelson A, Sutingco N. Ultrasound for procedural guidance: lumbar puncture. Manual of Emergency and Critical Care Ultrasound. First ed. New York, NY: Cambridge University Press; 2007. Vol 1: 234-7.